The Strike Force camera is designed for those people who seek adventure most especially in the field of hunting, and it can also be used for security surveillance too. There are many features to go through with this game camera model. It features 10 megapixels picture quality that will enable you to capture excellent shots without any visible blur. Moreover, it can also record high definition video clips with sound for about 5 seconds to 2 minutes length, perfect for any occasion. The camera has a lightning fast 0.67-second trigger speeds and night time infrared flash ranges to 100 feet. So whether you are on any terrain, you do not have to worry getting professional shots because Browning Strike Force Game Camera is designed and perfect for this kind of use. It also includes a Browning Buck Watch time-lapse viewer software that will allow you to capture images at a specific interval that could help you create even more fascinating shots. This camera includes multi-shots that you could choose from. The first option is excellent for hunting scenes that allows you to capture 8 photos per trigger with 3 seconds interval. The other option is known as the Rapid Fire. In this option, in a single rapid burst, you could create and take up to six images every time the camera is triggered. The battery life of a strike force camera last long, that allows you to capture up to 10,000 images. The camera is convenient to use because of its amazingly smaller size, and it only weighs 1 pound that makes it easier to use. Another unique feature of this camera is its external feature because of its unique camouflage design that is effective in blending on the certain environment such as on trees. The quality of its photos is also exceptional for the reason that it could capture images with 10 megapixels resolutions without getting blurry, which could allow its users to zoom the captured images without getting pixilated. If you want to take videos, this camera is also perfect for you because of its video quality of 720p. Most importantly, this camera is a great deal for anyone because of its affordable price and its excellent qualities. According to some users, who were able to purchase and try the Browning Strike Force Game Camera, they rate this product highly positive because they were impressed by how this camera could create sharper pictures. It’s got a better quality regarding its flash and a better detection range that allows its users to capture the right edge of the field view whether in daytime or night time. The users find this astounding to use not just because of its ability to create high-quality photos and a high definition video, but because it is simple setup and easily mount. Additionally, it comprises a Python cable lock to secure that the camera will halt on a place. Moreover, when it comes to its battery, you do not have to worry because batteries could last for a long time because it uses 6 AA batteries. Furthermore, users love this camera because it is weatherproof. It can perform in temperatures ranging from -20 to 120 degrees Fahrenheit, which would allow you to capture amazing images and videos regardless of the season. This camera supports up to 32 Gigabyte SD cards. Even though this camera offers a lot of good features, just like everything else it also has its downside, according to some users who got negative experiences in using this model. The cheap plastic handle disrupts easily, so you better put some extra effort into handling the camera or else it would break. Users are having a hard time pulling out the SD card, so they have to use some tweezers to pull it out in its place. Another thing is that this model does not have any field viewer. It does not allow a user to view photos from the field or to check the orientation. Similar to any other camera from Browning Trail Cam, this camera has also its advantages and disadvantages. 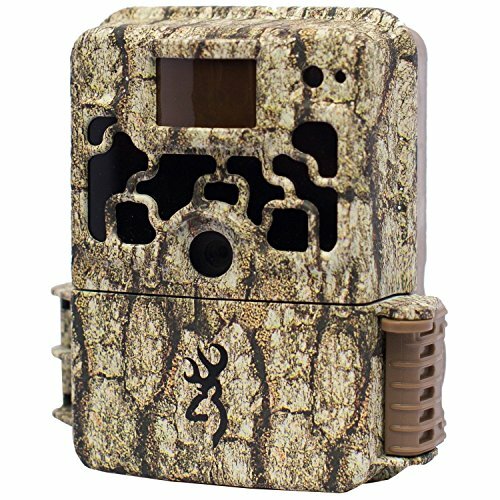 This is one of the best trail cameras because aside from being the smallest trail camera available in the market, it also has the best feature a camera could offer. It allows you to capture 8 photos per triggered without compromising its picture-perfect quality. Aside from that, it could also record and create high definition videos. Nevertheless, if you want a camera with a field viewer, then you should not choose this camera because it does not include an internal viewer. This camera is perfect for adventures especially for hunters because it covers the demands that the users look for to a camera with amazing features in its most affordable and customer friendly price.